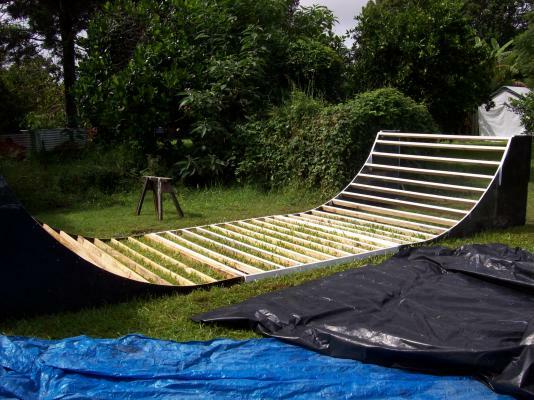 I am 15 years old and This is my Australian built 4' high and 24' long halfpipe. It has 2 layers of plywood and one layer of masonite also i made the platform a tad longer than on the plans also i used a transition of 7'. I have yet to put a water sealer on yet but i will get arround to it and because my dad is a concreter he has left over peices of marine ply and i guess that explains the cement marks. The halfpipe probably would of took a week of total labour if i had everything ready i would of been able to slap together in a week easy, but i'm lazy.